Posted April 16th, 2015 at 10:03 am. In today’s workplace, the ability to team up with others is crucial, as is the ability to communicate ideas in compelling ways using contemporary modes of expression. 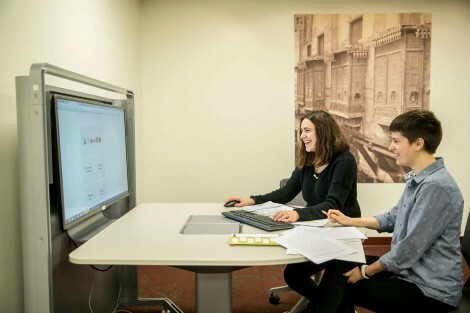 Bryn Mawr’s new Digital Media and Collaboration Lab enables students to hone these skills as they work individually and together on technology-based projects. Housed in Carpenter Library, the lab has four “media:scape” tables. Each has its own computer and monitor but also allows connections for up to four more devices (smartphones, tablets, or laptops). Students can toggle among devices to bring their screens up on the shared monitor for a seamless collaboration experience. Opening celebration to be held on Friday, April 17, from 12-4 p.m. All are welcome. No sooner had the new facility opened than students from across disciplines began making use of its cutting-edge technology—whether working on class assignments, meeting with faculty, or collaborating on group projects. “I’ve been surprised by the range of people who are in there,” says MacKay, recalling a recent afternoon when she observed a group of physics students who had made their way across campus to work in the lab while, at the next table, Cities Chair Jeff Cohen was there with his students. As befits a collaborative workspace, the lab itself was the work of many people across campus. Funding was provided by Library & Information Technology Services (LITS) and the Provost’s Office. LITS staff from Carpenter and Client Services, and educational technology and research support staff from across departments, worked together to plan and design the space around known curricular needs. Del Ramers, who will provide digital media support to students and faculty in the space, and Nancy Halli, Visual Resources Center Image Cataloger, were instrumental in the transformation of the space. The College’s curator Brian Wallace also contributed his expertise in designing the exhibition space. Right now, the display case features a plaster cast of a Greek kouros that was languishing in the Rockefeller basement for decades, and the walls sport enlargements of several photographs from Collections.